Few months back, everyone in the literary circles in India were discussing Neel Mukarjee’s Life of Others. It was first included in the long-list of Bookers Prize and later made in to short-list. Every bookstores in India started dedicating rows of space to this book and newspaper columns were filled with Neel’s interview. “Life of others” is based on the large Bengali family in Kolkata that gets caught in the mist of communist up-rising in the state. The Naxal-bari moment in the upper West-Bengal is important incident in the history of contemporary India and this book captures the after-math of the event through the narrative of the family. I tried my best to love this book, though it is very insightful, thought provoking and deep but I dont think so it is lovable. It is not so because this book is tragic, most of good books are that way. I expected the book to be a historical fiction but instead it was a joint family drama. There are so many characters that even after reading 200 pages, I had to go back to the family tree in the front page to find about the hierarchy of the character.Another disappointment was the stereotypes is the book specially concerning the Santhal community. However, the best parts in the book were in the narratives from the Supratik’s dairy. He takes us to the most unfortunate parts of villages and shares the struggles of suppressed farmers. Their struggling for basics and their viscus circles of poverty. It was not the narrative from the outsider’s point of view, because he had literary lived the life of others. The book started with the story of the starving farmer who commits suicide after killing his family. That particular part was very moving. The tone of the book was set to be emphatic but when the plot was taken over by the family saga of the wealthy Gosh family, it started taking more spins than required. The book jacket is very beautiful, one of the best I have seen in recent months. In her last book, Jhumpa Lahiri also flirted with the Naxalbari movement but in her book, it was more backdrop than the main plot. I expected more from Neel’s book and the fact it was nominated for major awards had also lifted my expectations. I thought that the book had more to offer than it did. 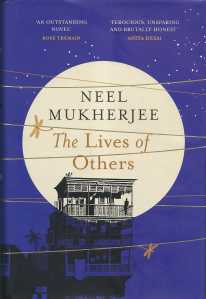 I gave “Life of others” by Neel Mukurjee 3 out of 5 stars in the goodreads. A marvel effort for the drifted cause. Actually what you’ve said is true, it’s not a ‘lovable’ narrative. Another thing is that, it’s very much based on Naxal Movement and incidents from that period…it’s somewhat difficult to get the essence if you’re not a Bengali. Those family names and relations…difficult to remember for those who are not acquainted with them. Thank you Maniparna for your insightful comment. I have read about Naxal movement before and in fact I initially thought that this book is a historical fiction based on the era (that actually drew me towards the book).. I agree the names and relations were difficult to comprehend some times. I missed this post somehow. But I wanted to read this book since long. 3/5 isn’t bad, might pick it up!